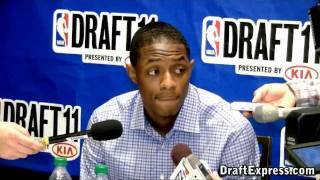 Brandon Knight (6-1 ½ without shoes) was the lightest player in Chicago at 177 pounds, and registered the second lowest body fat percentage at 4.2%. Amongst point guards drafted in the top-15, Knight's height/weight combination is similar to Jason Terry's (6-1.5 without shoes, 176 pounds). His 6-6 ¾ wingspan is well above average, and his size should be an advantage for him as he continues to pack weight on his frame. Brandon Knight capped off his up and down freshman season with a pair of game winners and a 30 point explosion during Kentucky's run to the Final Four, despite shooting just under 33% from the field in the tournament while committing nearly 3.4 turnovers per game, showing the quandary he places NBA decision makers in. Those numbers may hide some of the progress Knight was making as the year went on. Knight averaged an astounding 4.7 turnovers per game over his first seven games, struggling both with his ball handling and decision making as he was playing a largely isolation game trying to make the major transition from high school to college. Knight played for a small, academic oriented high school in Florida where he was asked to play a be-all, end-all role in every moment on the court, and adjusting to the rigors of a new system on a team playing an incredibly challenging schedule almost immediately was a major learning experience for the young point guard. As the year went on Calipari put Knight in more and more in pick and roll and dribble hand off situations, allowing the guard to take advantage of the attention he receives in these situations and generate offense for his teammates, while limiting some of the turnover problems and over dribbling that plagued Knight earlier in the season. Well known as a very intelligent player and person both on and off the court, Knight's basketball IQ improved visibly from game to game and week to week, culminating in his very impressive SEC and NCAA Tournament performances in March. Despite the improvement towards the end of the regular season, Knight clearly still has a lot to improve upon before answering the questions about his ability to play the point guard position full time in the NBA, as is evidenced by him being near the bottom of all point guards in our Top-100 rankings in pure point rating and assist to turnover ratio. Even with the improvement in his decision making late in the season, he still has a tendency to force the issue and lose his dribble in traffic , at times getting too deep on dribble penetrations without an outlet. While capable of making some outstanding passes at times, Knight doesn't consistently show great court vision or the ability to control tempo. He's also not someone that is considered a great leader, as he's somewhat shy and reserved off the court, being described by those around him as having different interests than your typical 19-year old athlete. This could (and probably should) be viewed a major plus by many image-conscious organizations. With that said, all these factors combined are all things that NBA teams will need to ponder when projecting his initial role and long-term potential at the point. How much will he improve as a playmaker and leader with added maturity and experience? It's difficult to gauge precisely considering that he's just 19 years old and won't turn 20 until December, making him one of the youngest players in this draft class. As a scorer, there's a lot to like about Knight, and he has the versatility to fit in many offenses. He's a good, albeit sometimes streaky (largely related to at times poor shot selection), shooter with NBA three point range, who shows the ability to hit shots off catch and shoot situations, off the dribble, and coming off screens. He shows an ability to come off a baseline screen, make a tight curl, and square up and convert the attempt. He's also continuing to improve as a catch and shoot player, continuing to improve the consistency of his release on catch and shoot attempts, which he shows good form and elevation on. This ability to score off the ball should ease his transition to the NBA game, allowing him to get playing time off the bench as a combo guard, or perhaps starting next to either a big point guard or a ball-dominant guard/wing (such as Tyreke Evans), as he's learning the nuances of the NBA point guard position. With the ball in his hands he is hard to defend in pick and roll situations, as he has the speed to turn the corner going right, and shows an ability to hit shots off the dribble if defenders go under the pick, although he could improve his recognition as a passer in these sets, a statement you could make about his offensive game in general. He's a good isolation player who uses his first step and misdirection moves to get into the paint. When in the paint he's not the strongest or most explosive athlete, but has very good touch with his right hand, which he combines with floaters and runners in the lane, doing a good job of shielding the ball from defenders, to get his shots off effectively over bigger defenders. He is strong hand dominant, particularly when finishing around the basket, as he'll often times force an attempt with his strong hand, back into the defender. He could stand to improve his free throw rate, as his 5.1 free throw attempts per 40 minutes pace adjusted is just towards the middle of the pack in terms of point guards in our database. Without the ability to explode towards the rim he often times settles for finesse moves in the 5-10 foot range rather than trying to draw the contact, a tendency that could increase against the stronger rim defenders in the NBA. In order to maximize his efficiency, he'll need to get better at drawing foulsa process many young guards, such as Derrick Rose and Stephen Curry, learned after they got to the NBA. Defensively presents more problems with Knight when projecting his role to the NBA. He has the physical characteristics to be a solid defender at the point guard position, with good size, solid length (wingspan measured at 6-6 at the Nike Hoop Summit), and above average lateral quickness. When he gets into a solid stance and gives good effort he appears to move well enough laterally to be able to defend the position. That effort and attentiveness wasn't always there during his collegiate career, particularly earlier in the season. He also struggles defending the pick and roll, at times struggling to fight through the pick and recover. While he has solid size to defend the point, if he's forced to defend the shooting guard position at the next level he's going to be at a distinct disadvantage. Projecting Knight to the next level, the diversity of his scoring and shot-creating ability allows him to be more effective off the ball than many combo guards, which could be a key in his minutes early in his career, as it's unlikely a coach is going to hand the reigns of an offensive over to him at this time until he garners more experience and improves his decision making. On the right team, with either a big point guard or a wing player who runs a majority of the teams half-court offense  such as the Lakers, Philadelphia, Miami  could be his best situation to contend for a starting spot early in his development playing for a franchise that is looking to win now. If not, there will be some growing pains Knight and the team that picks him will experience early on, but considering his youth and high basketball IQ, he could improve rapidly if allowed to learn through his mistakes. The impact that scorers in Knight's mold are making in today's NBA is considerable, so it could certainly be reasonable for a bad team picking very early on in the draft to attempt to mold him on the fly into what they need him to be down the road. The player who stood out the most today was Brandon Knight. After struggling to find his stroke last week until the waning moments of the McDonalds All-American Game, Knight looked extremely good during the scrimmage, hitting a couple of threes from behind the NBA line and looking much more active and in control than he did in Columbus. Knight also put his athleticism on display, coming away with a couple of dunks on broken plays and using his jumper to set up his first step. Though we didnt see the playmaking from Knight that wed hoped, he was splitting time between the one and the two. When he was running the show, Knight was more vocal than we saw him in any other practice weve watched recently, telling his teammates where to go. On top of his showing offensively, he also showed some nice things defensively. Knight has exceptional lateral burst, allowing him to prevent dribble penetration and create some turnovers with his length. Built like an NFL wide receiver, this was much closer to what we expected out of Knight coming in. Weve spoken at length about Knight previously this year, as even though he was just a sophomore hes received a great deal of attention very early on in his career so far. Knight looked a little bit better in his regular high school setting than he did here in AAU, as the frenetic pace his team likes to play at seems to take away somewhat from what his biggest strength isthe terrific poise and composure he shows for such a young point guard. Knight is still the same extremely unselfish playmaker we saw back in July, but he seems to be shooting the ball far too much from behind the arc. Hes not the most consistent shooter by any stretch of the imagination, especially off the dribble, as his shooting mechanics are not the best and he definitely didnt show much hesitation hoisting up questionable shots. Knight is still an extremely intriguing young player, though, as he has great size for a point guard, an excellent feel for the game, a nice first step beating opponents off the dribble, and the ability to change directions smoothly and take the ball extremely aggressively to the rack. Knight can really defend when he wants to, but he seems to gamble a little too much for steals, which might be his teams game-plan. as Team Breakdown won their bracket in the Reebok tournament, and won the AAU Nationals in Orlando both this year and last.